What’s Up with Bloody Facial Treatment? I was shock today after seeing Kim Kardashian’s photo with a bloody face, and in my head I actually thought that Kanye beats her at her face lol. The photo is after the procedure she has done in her reality shows "Kourtney & Kim Take Miami” as she undergoes the vampire facial with her BFF Jonathan Cheban, Kim actually screaming out for pain saying: “Oww! That hurts so badly” and this is for the sake of beauty and the ratings of the show lol. 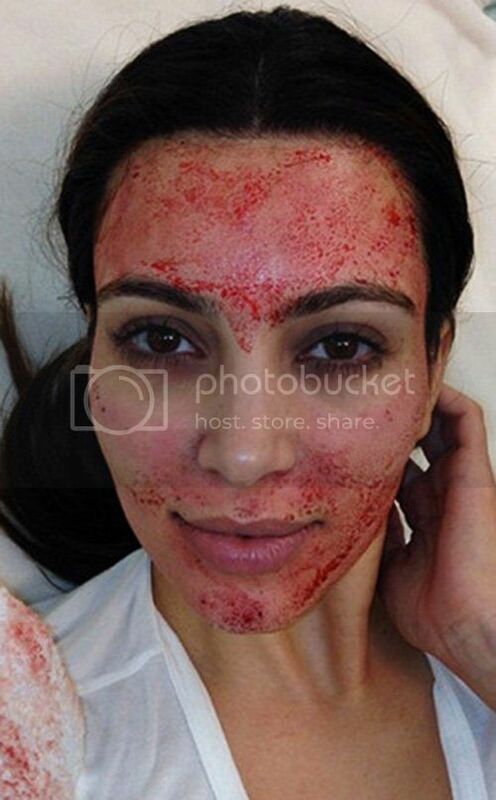 So what is this Vampire facial is all about, a skincare treatment that involves getting a blood from the patient and re-injecting it underneath the skin in order to achieve a healthy, youthful glow and it really sounds painful as Kimmy does in her show. According to expert, platelet rich plasma (PRP) can reduce the appearance of fine lines and wrinkles and improving the skin’s tone and texture. Keep watching Kim Kardashian for the next day or months and see the results, lol. Ummmmm....wow. No words other than, too bizzare for me. I'll pass....way too freaky for me! Yikes! What in the world are people thinking? Makes you wonder what beauty regime they would not adopt in their quest to stay young forever if they would gladly go through this.